Proof that—as with The Third Man (Essential Movie Library #4), Tokyo Story (Essential Movie Library #17), and The Shop Around the Corner (Essential Movie Library #19)—greatness and perfection can sometimes be the same. Director Max Ophüls was German born, and like a lot of Jewish European filmmakers in the early 1930s, he sensed what was up once the Third Reich rolled into town. He spent the ‘40s in a Hollywood that mostly ignored him before finally recruiting him for crime pictures like Caught, which understood Howard Hughes was nothing if not a noir character, and Letter From an Unknown Woman, which understood melodrama is nothing if not tongue-tied opera. Finally in France in the ‘50s his sensibility found the home where it always belonged and the moment for which it always yearned, when Ophüls bid for immortality with La Ronde, Lola Montes, and Madame de…. Like Shop Around the Corner’s Ernst Lubitsch, Ophüls built a whole aesthetic—that included both a satiric eye and compassionate affection for the follies that turn fatal and social rituals rendered as tragic as they are absurd—out of grace notes. The web of deceit becomes indistinguishable from the lattice of desire, the heart abhorring a vacuum as much as nature does, when a passion that’s originally meaningless fills empty aristocratic lives to overflow and overtakes all its participants. 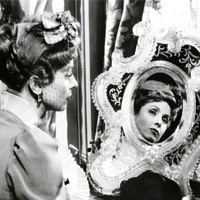 Through it all Ophüls’s cinematic gaze waltzes on, as glittering as the earrings with which the ultimately devastated, love-scorched madame played by Danielle Darrieux sets in motion a game whose rules are less forgiving to women than so-called gentlemen and their bankrupt notions of honor.